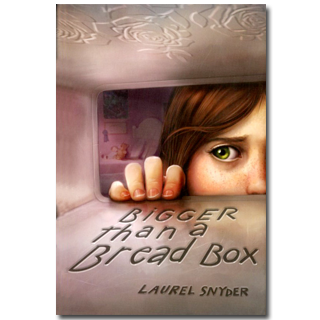 I recorded the audio book of Bigger than a Bread Box, and it was a moving experience. I’d never read one of my own books straight through, much less out loud! If you like audio books, or have a road trip coming, or you buy for a library or school, I’d be honored if you’d consider a copy. I’m proud of this. You can also get it on Amazon, if that’s your thing! Or you can grab it on itunes, if you’re an apple sort of person. This entry was posted on Monday, October 15th, 2012 at 9:40 pm	and is filed under Blog. You can follow any responses to this entry through the RSS 2.0 feed. You can leave a response, or trackback from your own site. I am definitely buying your audio book! When you Skyped with my students last year I commented how great it sounded..you reading your own book! AND you sang Springsteen for us! I hope you sang on your audio book, as well!